Customer feedback for Wedding flowers! We always love to hear from customers that are highly satisfied with our arrangements – especially from newlyweds! “I just wanted to say THANK YOU for the beautiful wedding flowers. They were even more beautiful than I imagined. 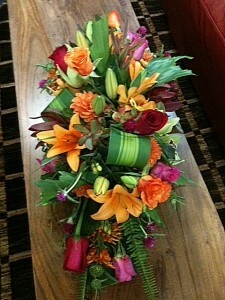 I loved that you incorporated the dahlias as that is Will’s favorite flower and the colors were just perfect. It was a gorgeous, magical day!